Including confessions in preparation for Christmas on Monday 16th December at 7.30pm in Ss. Peter & Paul’s Church. A number of priests will be available for confessions. 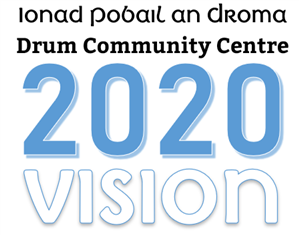 Will take place on Thursday 19th December at 6.30pm in Drum Parish Hall. Sincere thanks to the people of the parish for their generous support for the upkeep of the graveyard and particularly during their recent collection. The group wishes to acknowledge two very generous donations they received during this collection. These monies will help continue the good work that is being done by the committee and members of the group. Would like to thank everyone who attended and voted at the AGM. It was a great success. The organisers of Marathons4Muireann, Declan & Gina O’Flaherty, would like to sincerely thank the people of Drum, Clonown and surrounding areas for their extraordinary generosity during the Marathons4Muireann fundraising campaign. A total of €180,000.00 was raised in four months, which goes directly to three charities caring for severely disabled children and their families. This magnificent achievement would not have been possible without the exceptional support received from many individuals, small businesses and local communities – for that we say thank you. The HSE has launched a new free mental health service for Roscommon residents. 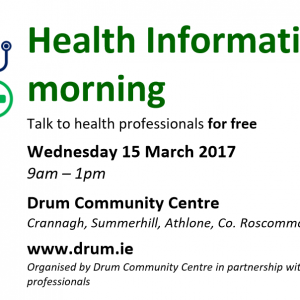 The service is offered throughout Roscommon and is available at Monksland Primary Care Centre and in Roscommon Primary Care Centre.